​When evil threatens the world, the world calls on Broforce - an under-funded, over-powered paramilitary organization dealing exclusively in excessive force. Brace your loins with up to four players to run ‘n’ gun as dozens of different bros and eliminate the opposing terrorist forces that threaten our way of life. Unleash scores of unique weapons and set off incredible chain reactions of fire, napalm, and limbs in the name of freedom. ...melding of sky-high chaos with clever mechanics. It’s daft, funny and extraordinarily well-crafted. 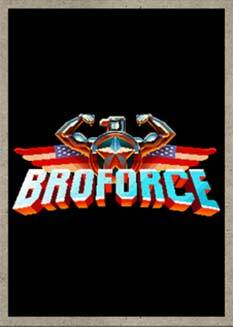 Broforce is pretty much what I had in mind when I invented America.